1. Planning Your Aviation Career . . . . . . . . . . . . . . . . .
2. Is an Aviation Career Right for Me? . . . . . . . . . . . . .
3. Do I Need a College Degree? . . . . . . . . . . . . . . . . . . .
4. Big School or Small School? . . . . . . . . . . . . . . . . . . . .
5. Age: Not the Factor it Once Was . . . . . . . . . . . . . . . .
6. Midlife Career Change: Is Faster Better?. . . . . . . . .
1. The Networking Factor . . . . . . . . . . . . . . . . . . . . . . .
2. Which Rating, When? . . . . . . . . . . . . . . . . . . . . . . . . .
3. Spending Your Flying Dollars Wisely . . . . . . . . . . . .
4. Good Instrument Skills are a Must . . . . . . . . . . . . .
5. Ab Initio Training . . . . . . . . . . . . . . . . . . . . . . . . . . . .
6. Accelerated Training: Is It for You?. . . . . . . . . . . . .
7. Simulators: Help or Hindrance? . . . . . . . . . . . . . . . .
1. Begin with an Airport Job . . . . . . . . . . . . . . . . . . . . . .
2. Early Job Opportunities: Make Your Own . . . . . . .
3. Job Opportunities for Older Pilots . . . . . . . . . . . . . .
4. Becoming an Instructor, a CFI . . . . . . . . . . . . . . . . .
5. Getting Paid to Fly . . . . . . . . . . . . . . . . . . . . . . . . . . .
6. Moving up the Job Ladder . . . . . . . . . . . . . . . . . . . . .
7. From Amateur to Pro: Crossing the Line . . . . . . . . .
8. Other Flying Careers . . . . . . . . . . . . . . . . . . . . . . . . .
9. Career Choices: Making the Right Moves . . . . . . . .
10. Building Quality Flight Time . . . . . . . . . . . . . . . . . .
1. Relationships and Your Airline Career. . . . . . . . . . .
2. Obstacles Facing Women Pilots. . . . . . . . . . . . . . . . .
3. Perceptions: Often of Our Own Making. . . . . . . . . .
4. Dealing with Discrimination. . . . . . . . . . . . . . . . . . . .
5. 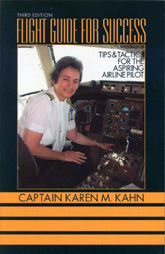 How Women Pilots Succeed. . . . . . . . . . . . . . . . . . . .
6. Balancing Family and Career. . . . . . . . . . . . . . . . . . .
1. Marketing Yourself: If You Don’t, Who Will? . . . . .
2. Career Quandary: Corporate or Airline?. . . . . . . . .
3. Don’t Let Glitches Stall Your Career . . . . . . . . . . . .
4. Learn from the Mistakes of Others . . . . . . . . . . . . .
5. Mistakes You Wish You’d Never Made . . . . . . . . . .
6. Acknowledge Your Shortcomings . . . . . . . . . . . . . . .
7. Job Continuity: How Crucial Is It? . . . . . . . . . . . . . .
8. Getting Back Into Flying . . . . . . . . . . . . . . . . . . . . . .
9. Military to Airline—Plan Ahead. . . . . . . . . . . . . . . . .
1. Logbooks 101: Neatness Counts . . . . . . . . . . . . . . .
2. Logbooks: An Interviewer’s Perspective. . . . . . . . .
3. A Current Resume: Your Best Sales Tool . . . . . . . .
4. Will Your Resume Get You an Interview? . . . . . . . .
5. Resume Etiquette . . . . . . . . . . . . . . . . . . . . . . . . . . . .
6. Job Applications . . . . . . . . . . . . . . . . . . . . . . . . . . . . .
7. Job Applications: Dos and Don’ts . . . . . . . . . . . . . . . .
8. Job Applications: What Companies Want . . . . . . . .
9. Scrutinizing Your Own Airline Application . . . . . . .
1. Interview Preparation: A Multi-Step Process. . . . .
2. Interview Attitudes: Are Yours Appropriate?. . . . .
3. Why Won’t They Interview Me? . . . . . . . . . . . . . . .
4. Avoiding Canned Interview Responses . . . . . . . . . .
5. Why Won’t They Hire Me?. . . . . . . . . . . . . . . . . . . . .
6. What Interviewers Really Want . . . . . . . . . . . . . . . .
7. Interview Post Mortem . . . . . . . . . . . . . . . . . . . . . . .
1. Have You Got What it Takes?. . . . . . . . . . . . . . . . . .
2. Selling Yourself: Sing Your Own Praises . . . . . . . . .
3. Technical Knowledge: An Interview Must . . . . . . . .
4. Career Commitment: Does Yours Measure Up? . .
5. Playing by the Rules . . . . . . . . . . . . . . . . . . . . . . . . . .
6. Leadership Skills: Are Yours Up to Par? . . . . . . . . .
7. Plays Well with Others . . . . . . . . . . . . . . . . . . . . . . . .
1. Flying the Simulator: It’s Not an Airplane! . . . . . . .
2. You’re Hired! Now What? . . . . . . . . . . . . . . . . . . . . .
3. Ground School Starts Monday: Are You Ready? . .
4. Surviving New–Hire Training . . . . . . . . . . . . . . . . .
5. Adapting to Life at an Airline . . . . . . . . . . . . . . . . . . .
6. Airline Culture: Do You Fit In? . . . . . . . . . . . . . . . . .
7. The Exceptional Copilot: Is That You? . . . . . . . . . . .
8. The Exceptional Copilot has Many Skills . . . . . . . . .
from Chapter I: Mid-Life Career Change: Is Faster Better? from Chapter VII: Why Won't They Interview Me? from Chapter VIII: Leadership Skills: Are Yours Up to Par?